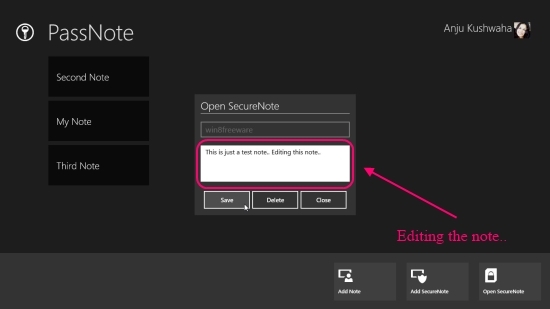 PassNotes is a free Windows 8 Notes app that lets you create multiple notes and secure them with a pin. Using this free Windows 8 Notes app, you can make two types of notes: notes that are visible after login, and notes that are hidden and get accessible only with an associated key. First type of notes can be used to note down casual things while you can use hidden notes to save really confidential information such as bank passwords, ATM pins, etc. 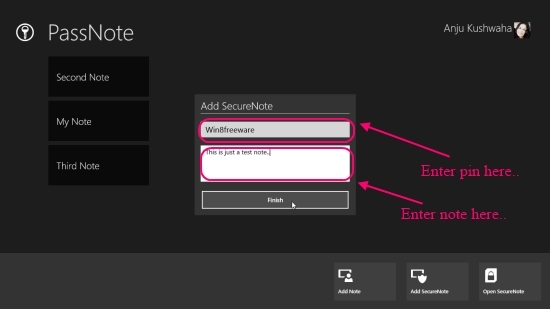 There are many other Notes apps available in Windows Store that allows creating notes and lock them using a secured pin. However, the special feature of hidden notes make this app a much superior in the list. You can add multiple notes, edit, and also delete them from the app. PassNotes is freely available in Productivity category of Windows Store. You can view the app directly in Windows Store by clicking on the link given below at the end. Let’s see how you to use this Free Windows 8 Notes app. As you launch the app, you will be presented with a screen to set login. You will be required to enter this login every time you open the app. After logging in, you will land on the app’s main page that looks quite blank initially. As you right click on the app’s screen, the app bar will display options Add Note, Add Secure Note, Open Secure Note. Click on Add Note to add a new note in the app. Enter a title and description in the specified fields and click on Finish to save your note in the app. You can add multiple notes in the app likewise. The list of saved notes will appear on the app’s screen displaying their titles. To add a secure note in the app, click on Add Secure Note. Fill in the specified Key and Value fields. Now, click on Finish option. Your secure note is saved in the app but you will not find it anywhere on the app’s screen. To view information in this hidden note, click on Open Secure Note option. Type in the associated key to access information saved in the note. You can view, edit, or delete this secured note if required. Also check The Colour Notes, Note Anytime, and Bamboo Page. 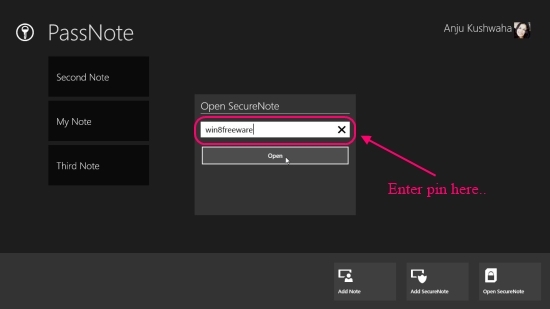 PassNotes is a nice free Windows 8 notes app that lets you make notes and lock them with secure keys. Give it a try and share your views via comments.